Stromness Spirit of the Sea - a three day event celebrating Stromness in Orkney. What is Stromness Spirit of the Sea? 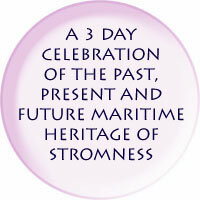 Stromness, Spirit of the Sea is a three day celebration of the past, present and future maritime heritage of Stromness. The town of Stromness in Orkney has always been the port for the ferry to Mainland Scotland. It is 400 years old and has a rich history of Vikings, pirates, Canadian trade routes, Arctic Whalers, herring fishing and the events in Scapa Flow during the first and second World Wars. The town has rich characters, and has inspired poets and explorers. It is a distinctive and picturesque town, situated along the waterfront with a narrow winding main street, labyrinthine lanes, and piers leading down to the sea. Visit our Stromness page to find out more about the town. Stromness is also a unique centre of Orkney business, seafood, produce, arts and crafts and you can find out more on the Stromness Map page. From Thursday 13th September, 2012 until Saturday 15th September 2012, Stromness Spirit of the sea will feature events, activities and performances for all the family. These events will be a celebration of Stromness and its people's relationship with the sea. During these three days you can enjoy talks, workshops, boarding historical boats, personalised guided walks, music, rum and seafood tastings, boat tours and talks from older Stromnessians about the town in days gone by. Events will cover the past and the future - Stromness's exciting new role in Marine Renewables will be discussed! Make sure you visit our Events page to find out more. These are just some highlights of some of the many events and festivities we have in store over the three day Stromness - Spirit of the Sea. To see full event listings for Day 1 - Thursday, 13th September, Day 2 - Friday, 14th September and Day 3 - Saturday, 15th September, please visit our events page!